You might not know this about me, but I get pretty excited about organic, grass-fed meat. Yes, it’s true: I danced quite the happy jig when the folks from America’s Farmstand sent me a beef sampler from Englebert Farms. While I never got around to writing a One Simple Change blog post about meat, there is actually a chapter in my book about why you might want to reconsider it if meat is something you never eat. There are compelling reasons not to eat industrial meat, of course (like ingesting residues from antibiotics and hormones, as well as genetically modified crops and pesticides that are in the animals’ feed, plus the meat of grain-fed animals has a poor fatty acid profile), but that’s not the meat I am recommending you include in your diet…meat that is raised humanely on grass/pasture is very different from it’s factory-farmed, grain-fed counterpart. Grass-fed meat is very nutrient-dense: it’s a great source of protein, iron, B-vitamins (including B12: a nutrient that’s vital to the nervous system and is only found in animal foods), selenium, and zinc. It’s also a source of CLA (conjugated linoleic acid, a fatty acid with potentially anti-cancer and weight reducing properties). As for the saturated fat in meat that many people fear: it’s important to understand that like cholesterol, saturated fat isn’t all bad. Saturated fats are important for the structure of all cells in the body and they boost the immune system. Saturated fats are also necessary in the diet for proper absorption of minerals such as calcium and for optimal storage and assimilation of the unsaturated omega-3s (ie omega-3 fatty acids are even more effective when they are combined in the diet with some saturated fats). Need other reason to choose organic, grass-fed meat? The farmers who are raising their animals traditionally and sustainably deserve and need our support to keep on doing what they’re doing. I spent a long time as a vegetarian when I was younger but I feel much healthier when I am eating some meat. For this reason, why I am truly grateful for local farms where I can source high quality meat, and to America’s Farmstand for sending me the meat that I used in this recipe. Not everyone requires meat in their diet, but you might want to add some to yours if you don’t eat any and you are not enjoying optimal health. Always remember to choose grass-fed meat! That said, this salad is delicious without the chorizo, too. This salad was inspired by one in the brand new, unbelievably gorgeous cookbook What Katie Ate: Recipes and Other Bits and Pieces by Katie Quinn Davies. I am having a lot of fun with this book: I bought it because I am a huge fan of Katie’s food photography, but I’ve made a number of the recipes and they’ve all been REALLY great. 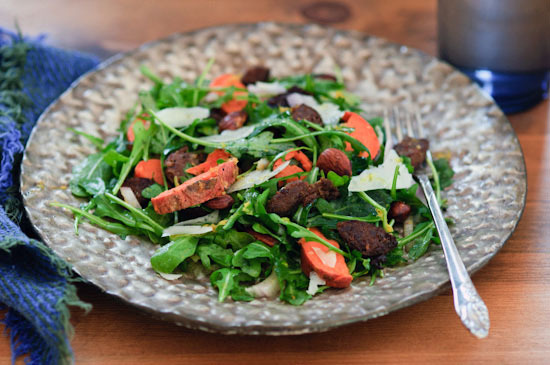 The chorizo salad in the book includes white potatoes and sundried tomatoes. I had neither so used the sweet potatoes and sea salted Marcona almonds (that I found at Trader Joe’s), instead. This salad is easy to make, but it's complex in flavor. It's bitter, spicy, sweet, crunchy, and salty all at once, and the lemony dressing is like a burst of sunshine on a winter day. I keep cooked sweet potatoes on hand pretty much all the time. To prepare them, I poke them all over with a fork, wrap them in foil, and bake a few whenever I have the oven on for another reason. In a pinch, though, you can cook a sweet potato in the microwave. 1. Heat 1 tablespoon of the oil in a skillet over medium heat and add the chorizo. Fry for about 10 minutes (or until the slices are crisp). Remove from skillet and in a medium bowl, mix with the sweet potato and lemon zest. 2. Whisk together the remaining tablespoon of olive oil and the lemon juice and season with salt and pepper. 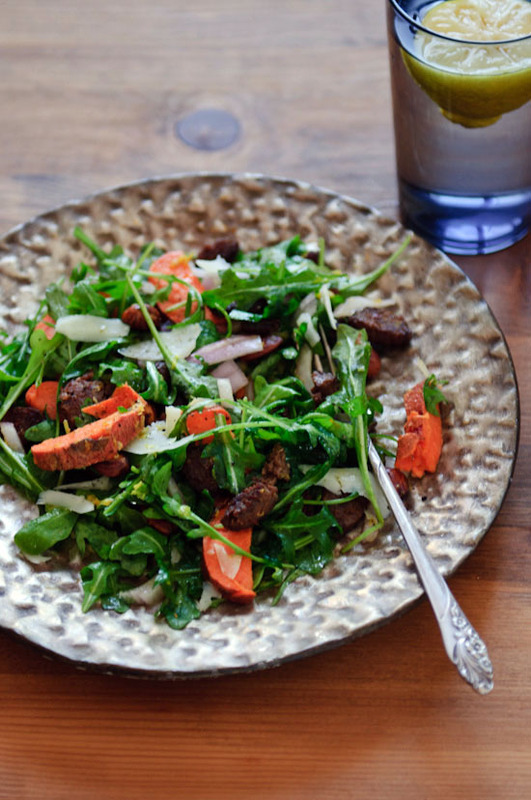 Arrange arugula, red onion, almonds, and sweet potato/chorizo mixture on a serving plate and pour the dressing over. Top with Manchego shavings and serve. Adapted from What Katie Ate: Recipes and Other Bits and Pieces . *Disclosure: This is not a sponsored post but I did receive the chorizo I used in this recipe as a gift (as part of a a beautiful package of organic, grass-fed meats) from America’s Farmstand, an online farmer’s market of sorts. America’s Farmstand connects farmers and producers with consumers, without the warehouses and supermarkets in between; they have a wonderful selection of products that you should make sure to check out. I cut meat out of my diet dramatically the last few years, started bringing back higher quality meat this past year. I feel so much better about eating it & feeding it to my family. It makes me happy that it’s becoming more available. I have my eye on this cookbook! What a beautiful salad! this may seem like a weird question, but where can you find grass fed chorizo? And what brand do you buy? I’ve been trying to find a brand that carries this kind of chorizo (and hopefully sugar free) because of the special diet I’m following (SCD/GAPS). Gorgeous salad, and full of some of my favorite things! I love the What Katie Ate cookbook, it’s gorgeous and full of inspirational photos. I live in NYC, do you know if Englebert Farms sells anything down here, maybe at the Greenmarkets? 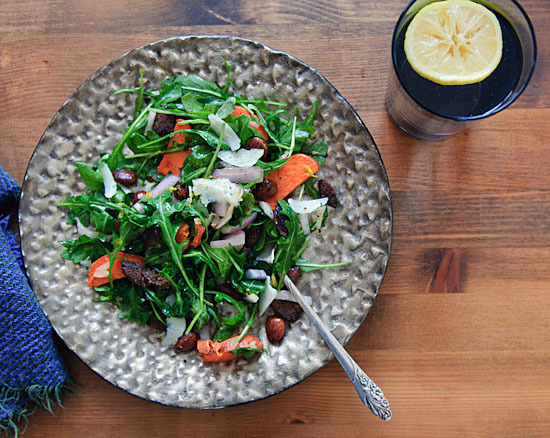 Beautiful salad, I love the sweet potatoes and your Meyer lemon dressing! Such a beautiful thing….love chorizo AND manchego (love your plate too)! Nice salad. I love all things Spanish. The manchego is such a great idea. I just made something very similar: figs stuffed with chorizo and topped with cheese and almonds. I’ve been struggling with the meat issue as well. I’m not prepared to give it up, but there are such compelling arguments for doing so. Posting what I eat online now has made me even more conscious of the struggle. I like the way you make a case for a better way of doing it rather than giving it up completely. Thanks. p.s. I haven’t visited your space in quite a while, and I was going over some of your recipes – so many good ones! So many I NEED to try myself.